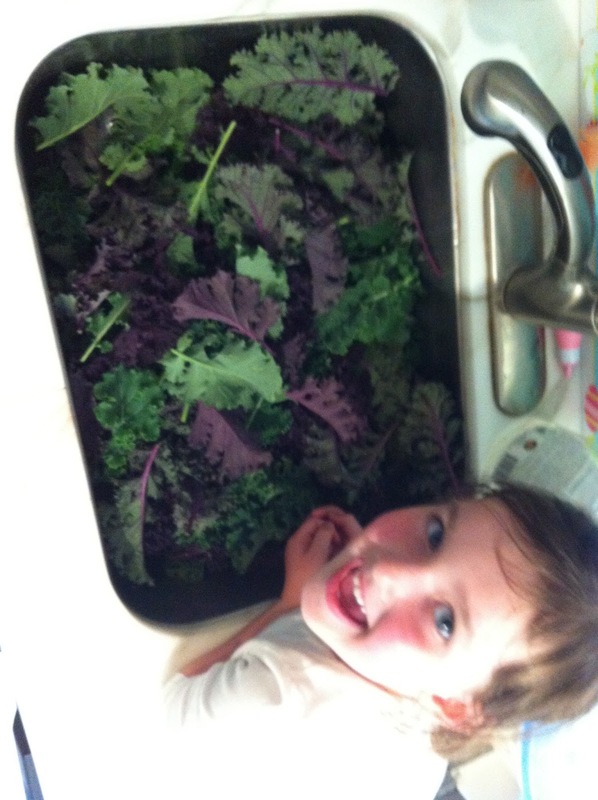 Not being much of a gardener, I was pleasantly surprised by the sink-full of beautiful, organic green and purple kale that my children and I harvested from our garden last weekend. Not being much of a cook, I was also a little overwhelmed as to what to do with such bounty. Being, however, always totally shameless in my solicitation of information from my much more accomplished friends and family, I now have wealth of what to do with a sink-full of kale knowledge that I am pleased to be able to share as part of my first ever food-related post. In no particular order, here are things that one should apparently be doing with kale, including buying an Eat More Kale T-shirt. My kids will eat as much as I can make. All I ever do is saute it with olive oil or butter and add either a little lemon juice or a little lemon pepper. Saute until you get a good mix of crispy and tender. Yummy! They always eat it first, ask for more and fight over the last bit, no matter how much I make! From my former colleague and good friend, who even with an infant in tow, makes cooking seem like a joy and has promised to write Guest Post about just that. Sauté a sliced onion until almost carmelized, add chopped kale. Sauté. To finish, add 3-4T of Tamari, some fresh lemon juice and top with chopped toasted pecans. DELISH! Bake it! Rip it into bite size pieces off stems, massage with olive oil, add salt and pepper and bake at 400 for 15 mins or so. Sooooo good! Ellie has a great recipe for a Korean soybean paste soup with kale, onion, tofu, and mushrooms. Our favorite is kale salad with faux ceasar dressing! yum! Based upon the above, and what I know from my own adventures with cooking and perusing my pantry, I made lemon parpardelle pasta with kale sauteed in olive oil and salt, topped with toasted walnuts and grated pecorino cheese. It was pretty good and I look forward to trying some of the above recipes with the amazing amount of kale I still have in my fridge. My daughter refused to eat any of the kale until I told her about my friend's kids who fight over their kale because they love it so much. Suddenly she couldn't get enough, as long as I cut the kale into bite-sized pieces for her. Thank you to all who contributed and inspired me and hopefully others to experiment with one of the healthiest foods there is. I will warn you all though - be prepared to floss your teeth after dinner. The kale has a way of sticking around, if you know what I green.